We were awarded the Coca Cola “Living Positively” Award for this project. It was accepted by Dave Calder on behalf of the team. 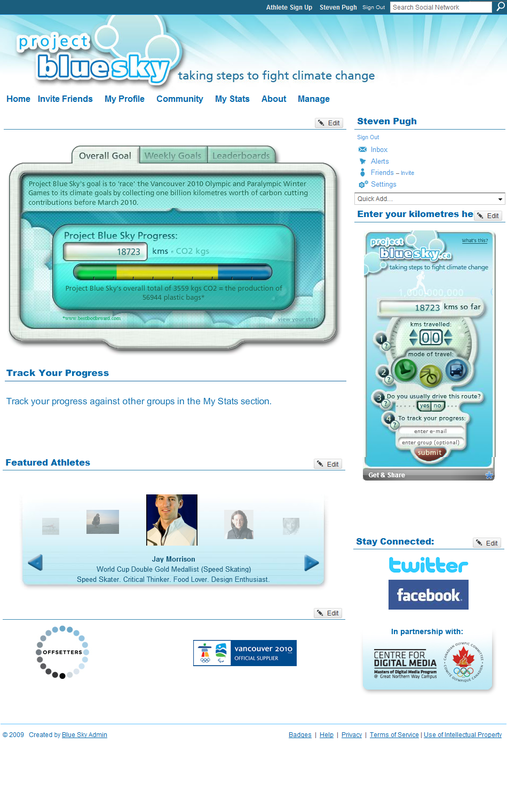 My latest project has been helping out the University of British Columbia’s Centre for Sustainability and Social Innovation (or CSSI) on an Olympic Athlete inspired project called “Project Blue Sky“. The premise is to get people to walk, bike, or use public transit instead of their car to reduce their carbon footprint. By entering their distances into the widget they can see how, if everyone contributes, we can make a difference. I was fortunate enough to go back-country skiing in the Selkirk Mountain Range this past week. Back-country skiing is really neat because you’re getting to ski in untouched powder snow that is soft, fluffy, and uncrowded to ski in, unlike regular ski hills. Using Alpine-touring skis and fur skins (to give you traction) you hike up to the top of a hill and then switch to downhill mode and ski down. Skiing down is different from on a groomed slope because the snow is so thick it would slow you down to a standstill if you used traditional techniques. So you have to kind of “bounce” your way down the hill. It’s neat because if you’re used to doing blue runs with an occasional black diamond, like me, you find you can do much steeper hills and get a real nice flow to your skiing. It’s lots of fun! I even got to check out a natural ice cave! It’s quite pretty inside with the sunlight turning the ice shades of blue.